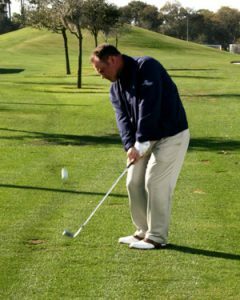 Pitching the ball either a short distance 20-30 yards or approaching a green from 60-70 yards can be a very difficult golf shot for many. 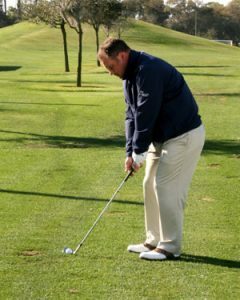 Hopefully with some tips from this article and of course some practice you can start to hit the ball closer to the flag more consistently and in turn reduce your scores. For this article I have employed the use of a child’s small light soccer ball to help illustrate the link between the arms and body that I feel is extremely important in this shot. 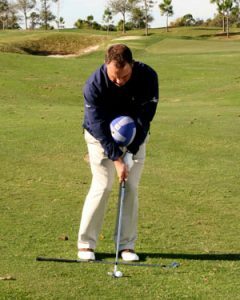 Because this is a relatively short shot we don’t need a lot of dynamics in it, meaning we don’t need a strong movement from the body to help produce fast club head speed. 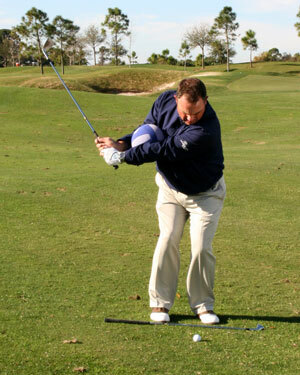 We do however need feel and quality of stroke, therefore placing a ball between your forearms and hitting half shot is a good way to get a sense of how to link your body movement to your arm swing without either one of them being too overpowering. As you can see, I have set up with the ball between my forearms and then made my swing. The ball stays in front of my chest at impact. The ball remains there into my finish . After some practice, I could feel the partnership between my arms and body and found it easier not only to produce a more consistent strike but also to control my distances more accurately. One last point I would like to share with you is the fact that a good pitcher of the ball or anyone that is consistent in the short game has an impact position very similar to their set-up position. 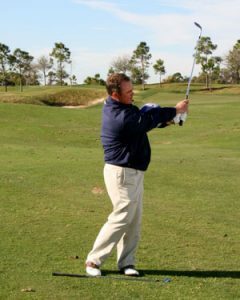 You can see my set up with a solid base and slightly open shoulders, then you can see at impact again my base is solid and my shoulders have opened through impact . 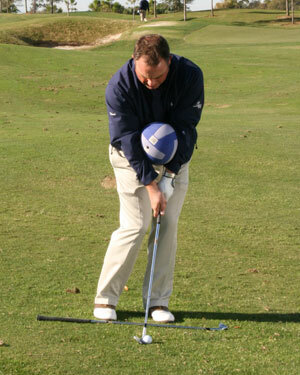 This produces the clean striking that all good short game players have. Practice these points and learn to control your distances and watch your scores improve.